You can buy dough from the store, or make it yourself. 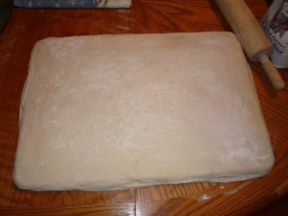 If you buy the dough, take it out of the package, cover with flour & let sit for an hour. Once it is warm enough to stretch, roll out to about the size of a cutting board. Chop 2 onions. Drizzle Olive Oil in a pan, and toss in the onions. Add Chop Meat a little at a time. 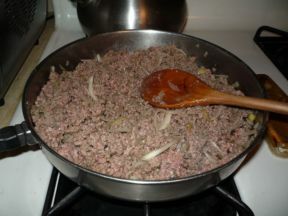 Brown the meat, and then drain the fat. Divide the meat into 2. 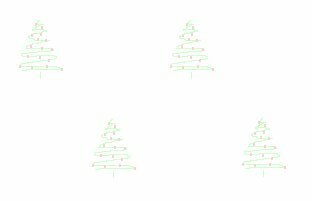 This way each pie will be equal. Set the pan in front of you long ways. Fit the dough across the pan, hanging the ends over the pan. 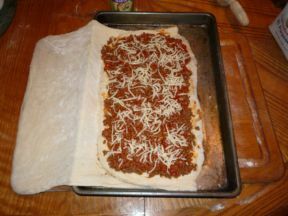 Fill the middle of the dough with half the chop meat. Lightly pour tomato sauce over meat. Add cheese if desired. Make sure to go to the end of the dough with meat. 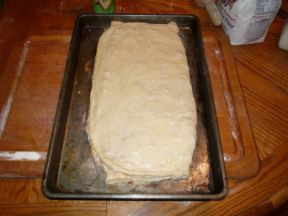 Fold the right side of dough over the meat. 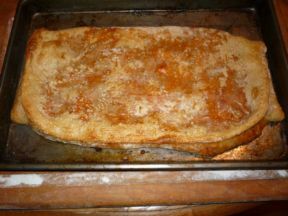 Add the other half of meat over the middle section of dough. Lightly pour tomato sauce over meat. Add cheese if desired. 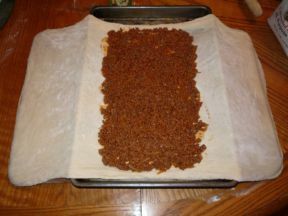 Fold the left side of dough over the top section of meat. Make sure to overlap the edges to prevent leaks. Use tooth picks if needed. Beat the egg yolk & a quarter cup of milk. Brush the egg yolk over the dough to create a glaze. Preheat oven to 400 degrees & bake for 25-30 minutes. For us, best if served warm or at room temperature.